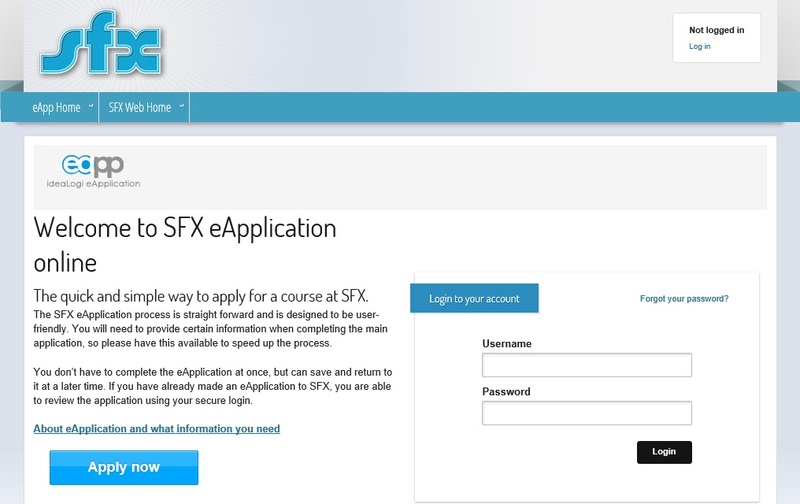 With the combination of our educational knowledge and technical expertise through our partnerships, SFX Corporate is therefore uniquely placed to offer a range of specialised services to institutions. The online products and services listed below have been developed, implemented and fully tested to ensure that they are fit-for-purpose and provide good value for money. Please feel free to contact our Corporate Division for more information and a product demo. • learner and staff tracking system with full search functionality, including staff access to individual learner records by subject, class or group information. Learners are able to track their own on-going performance against minimum target grades as well as aspirational grades. • pastoral information with full messaging and tracking, including access for parents/guardians via a ‘parent portal’ and a specific module tracking students in receipt of learning support. The dashboard is the customisable hub of e-ST (e-StudentTracker). Modules containing data tailored to the user can be positioned as desired via a drag-and drop interface. Data will include personal details, attendance and examination data, subject, pastoral and ILP reports, markbook, ALS and reference information. The Markbook module allows staff members to record homework assessment, examination and test marks for both academic and vocational courses. Teachers are able to track and monitor progress of individual students and groups by subject or topic. This is an excellent tool to monitor patterns of performance and where necessary implement early intervention strategies. It also empowers the department heads to monitor progress and performance of their curriculum areas. This information is available to staff and students via the dashboard interface. The Pastoral module allows for the monitoring of student progress, such as achievements and areas of concern, via a messaging and logging system populated via customisable forms. A particular important aspect is the pastoral log which brings together all information and comments regarding an individual learner in one place as a historical record. This module provides information on key aspects related to the learner, such as the type of additional learning support received. It also stores information about medical history, Free College Meals and Bursary status and other welfare issues and allows these to be easily accessed and communicated on a ‘permissions basis’. 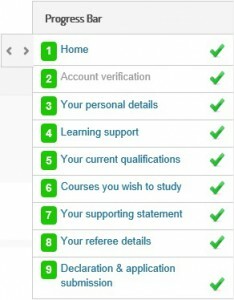 The References module provides a platform for students to complete their UCAS statements and for their subject teachers and personal tutors to complete their references. The Feedback module allows for custom surveys to be created and sent to specific individuals or entire groups of students. The results of these surveys can be viewed in a graphical form but can also be easily reported on. The feedback module is fully compliant with Ofsted criteria regarding learner voice. The Reports module allows for easy access to any reports you may already have set up through software such as SQL Reporting Services. Reports can combine information from all e-ST modules with information held elsewhere within college MIS systems. 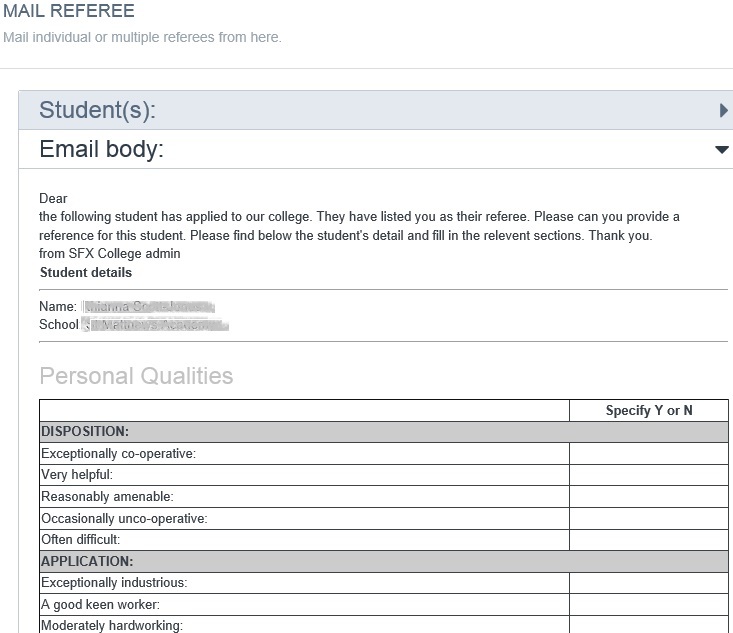 An initial simple registration screen provides a quick capture of key information that the marketing and admissions team are able to use to identify applicants who have not proceeded with a full application. The system also provides a high level of security and conforms with all data protection requirements. The registration validates postcodes and email addresses to avoid hoax postcode and email accounts. 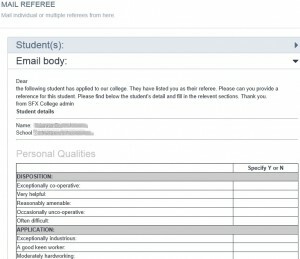 The application form is tailored to match the college’s existing application form and processes. The system allows for pre-populated data such as schools of origin and course/subject being offered at the college. A user friendly progress bar informs the applicant of the application status and ultimate completion. The application update section keeps the applicant’s informed of the application progress subsequent to submitting the application. The applicant is also able to review whether the reference has been processed, the date and time of their interview and whether they have been offered the course/subject they have chosen. Colleges can decide to opt for paper based or a full electronic referencing functionality, whereby the referee will receive notification of a reference request and will be asked to electronically return the reference to the college. The system allows for full tracking and monitoring of reference requests and received references. 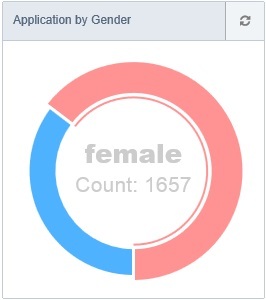 The eApp admin panel allows live updates on the application position and provides a range of statistics presented in the form of table, charts and graphs. The system provides a useful like-for-like comparison between current recruitment as and against previous years.